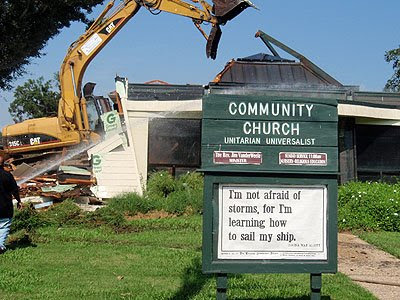 In August of 2005, flood waters from Hurricanes Katrina and Rita filled the homes and worship spaces of hundreds of Unitarian Universalists in the New Orleans area. Three years later, repairs to First Unitarian Universalist Church of New Orleans are still incomplete. North Shore Unitarian Universalist Society needs funding to minister to affected members and re-grow their membership. And in August, Community Church of New Orleans was forced to raze the remnants of their building due to revised FEMA regulations. Now the Community Church will have to rebuild their worship space from the ground up. These three congregations have joined together to form Greater New Orleans Unitarian Universalists, GNOUU–pronounced “guh-new”). GNOUU’s goal is to raise 2.7 million dollars over the next three years to support the rebuilding of their churches and ministries. Currently, they are over 200,000 dollars short of reaching the first million. This holiday season, please remember our extended UU family in the Gulf Coast, and show the kind of support that you would like to receive if your congregation was struck by disaster. Make a donation to GNOUU in honor of a family member or a church friend, or challenge yourself to donate a certain amount each month and set up a recurring donation. If you can’t afford to give a financial gift, consider participating in a service trip with The Rebirth Center, a volunteer service project stewarded by GNOUU.